> From 2001 to 2005 there was an ongoing investigation into the Clinton Foundation. A Grand Jury had been empaneled. Governments from around the world had donated to the “Charity”. Yet, from 2001 to 2003 none of those “Donations” to the Clinton Foundation were declared. > Hmmm, now you would think that an honest investigator would be able to figure this out. > Guess who took over this investigation in 2002? Bet you can’t guess. > None other than James Comey. Now, that’s interesting, isn’t it? > Guess who was transferred to the Internal Revenue Service to run the Tax Exemption Branch of the IRS? Your friend and mine, Lois “Be on The Look Out” (BOLO) Lerner. Now, that’s interesting, isn’t it? > It gets better. Guess who ran the Tax Division inside the Department of Injustice from 2001 to 2005? No other than the Assistant Attorney General of the United States, Rod Rosenstein. > Now, that’s interesting, isn’t it? > Guess who was the Director of the Federal Bureau of Investigation during this timeframe??? > I know, it’s a miracle, just a coincidence, just an anomaly in statistics and chances, Robert Mueller. > What do all four casting characters have in common? They all were briefed and/or were front line investigators into the Clinton Foundation Investigation. Now that’s just a coincidence, right? Ok, lets chalk the last one up to mere chance. Let’s fast forward to 2009. > James Comey leaves the Justice Department to go and cash-in at Lockheed Martin. > Hillary Clinton is running the State Department, on her own personal email server by the way. > The Uranium One “issue” comes to the attention of Hillary. Like all good public servants do, you know looking out for America’s best interest, she decides to support the decision and approve the sale of 20% of US Uranium to the Russians. > Now you would think that this is a fairly straight up deal, except it wasn’t, the American People got absolutely nothing out of it. > However, prior to the sales approval, Bill Clinton goes to Moscow, gets paid 500K for a one hour speech then meets with Vladimir Putin at his home for a few hours. > Ok, no big deal right? > Well, not so fast, the FBI had a mole inside the money laundering and bribery scheme. > Guess who was the FBI Director during this timeframe? > He even delivered a Uranium Sample to Moscow in 2009. > Guess who was handling that case within the Justice Department out of the US Attorney’s Office in Maryland? Rod Rosenstein. > Guess what happened to the informant? > The Department of Justice placed a GAG order on him and threatened to lock him up if he spoke out about it. > How does 20% of the most strategic asset of the United States of America end up in Russian hands when the FBI has an informant, a mole providing inside information to the FBI on the criminal enterprise? > Guess what happened soon after the sale was approved? > ~145 million dollars in “donations” made their way into the Clinton Foundation from entities directly connected to the Uranium One deal. > Guess who was still at the Internal Revenue Service working the Charitable Division? > No other than, Lois Lerner. > Ok, that’s all just another series of coincidences, nothing to see here, right? > Let’s fast forward to 2015. > Due to a series of tragic events in Benghazi and after the nine “investigations” the House, Senate and at State Department, Trey Gowdy who was running the 10th investigation as Chairman of the Select Committee on Benghazi discovers that Hillary ran the State Department on an unclassified, unauthorized, outlaw personal email server. > He also discovered that none of those emails had been turned over when she departed her “Public Service” * as Secretary of State which was required by law. > He also discovered that there was Top Secret information contained within her personally archived email. > Sparing you the State Departments cover up, the nostrums they floated, the delay tactics that were employed and the outright lies that were spewed forth from the necks of the Kerry State Department, we shall leave it with this…… they did everything humanly possible to cover for Hillary. > Now this is amazing, guess who became FBI Director in 2013? > Guess who secured 17 no bid contracts for his employer (Lockheed Martin) with the State Department and was rewarded with a six million dollar thank you present when he departed his employer. > None other than James Comey. > Amazing how all those no-bids just went right through at State, huh? > Now he is the FBI Director in charge of the “Clinton Email Investigation” after of course his FBI Investigates the Lois Lerner “Matter” at the Internal Revenue Service and exonerates her. > Nope couldn’t find any crimes there. > Can you guess what happened next? > In April 2016, James Comey drafts an exoneration letter of Hillary Rodham Clinton, meanwhile the DOJ is handing out immunity deals like candy. > They didn’t even convene a Grand Jury. > Like a lightning bolt of statistical impossibility, like a miracle from God himself, like the true “Gangsta” Homey is, James steps out into the cameras of an awaiting press conference on July the 8th of 2016, and exonerates the Hillary from any wrongdoing. > Can you see the pattern? > It goes on and on, Rosenstein becomes Asst. Attorney General, Comey gets fired based upon a letter by Rosenstein, Comey leaks government information to the press, Mueller is assigned to the Russian Investigation sham by Rosenstein to provide cover for decades of malfeasance within the FBI and DOJ and the story continues. > FISA Abuse, political espionage….. pick a crime, any crime, chances are…… this group and a few others did it. > All the same players. > All compromised and conflicted. > All working fervently to NOT go to jail themselves. > All connected in one way or another to the Clinton’s. > They are like battery acid, they corrode and corrupt everything they touch. > How many lives have these two destroyed? > As of this writing, the Clinton Foundation, in its 20+ years of operation of being the largest International Charity Fraud in the history of mankind, has never been audited by the Internal Revenue Service. > Let us not forget that Comey’s brother works for DLA Piper, the law firm that does the Clinton Foundation’s taxes. Damn, what a coincidence ! > * Really should be called “Pubic Service” due to how the American public has been screwed !!!! The Deep State may be on its last legs. Anti-Trump conspirators and leakers inside the government have schemed to destroy the President since the day he won the election. But Jeff Sessions has the one slip of paper that could be the silver bullet that cripples the Deep State for good. Eleven Republican members of Congress sent a letter to Attorney General Jeff Sessions demanding criminal referrals for a slew of former and current government officials who were the most associated with leaking damaging classified information as well as lying to investigators or Congress. 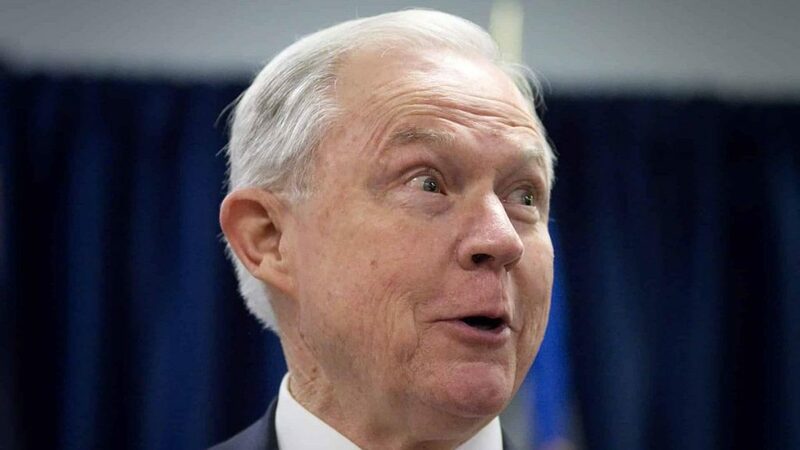 “Republican lawmakers on Wednesday sent a slew of criminal referrals to Attorney General Jeff Sessions for a number of Obama administration officials and senior FBI employees for violations of the law in connection to the Clinton email and Trump-Russia investigations. The criminal referrals, first reported by investigative journalist Sara Carter, were made by Rep. Ron Desantis (R-FL), a senior member of the House Judiciary and Oversight and Government Reform Committees who is leaving the House to run for Florida governor, and nine other colleagues. Prosecuting these alleged criminals would go a long way towards restoring the rule of law. Figures in Trump’s orbit have been prosecuted for lying to investigators. If the rule of law in America is applied equally, then it should apply equally to the entire ruling class. Bringing charges against Clinton, Comey, McCabe, and the other members of the cabal cited by the lawmakers would reassure Americans that the system isn’t rigged. The sense of frustration that the government only works for the benefit of the elite is what helped strike the match that led to the election of Donald Trump. Here is a copy of the letter for your perusal: Copy and paste to your address bar if necessary. The problem of the American national bankruptcy will not go away by trying to start World War Three. China and Russia will stop that. Indeed, they will win it before it even starts. Some say they already have. The problem of the American national bankruptcy will be moved closer to a benevolent and lasting solution when Washington determines to return to sound money. The current unsound fiat money laundry at the US Federal Reserve is manifestly unfit for purpose. It only benefits bankers, corporate oligarchs, market insiders and a few nouveau riche techies. In modern-day America, capitalism isn’t even working for the middle class. Nor can it pay for the military, prevent the infrastructure from crumbling, return American manufacturing to global competitiveness, or sustain a non-criminal political class. At the moment, the US dollar is made of paper and is backed by paper. It is a fiat currency. The problem is that no one important outside the US believes in American paper any more, or trusts the syndicate which writes it. A change is needed. The US dollar needs to be made of gold. Asia and Africa have the necessary gold and are willing to use it to support the emergence of a new, transparent and fully Constitutional USA. The USA is not the US. These are two completely different legal entities. referred to the Committee on Financial Services. (1) The United States dollar has lost 30% of its purchasing power since 2000, and 96% of its purchasing power since the end of the gold standard in 1913. (2) Under the Federal Reserve’s 2% inflation objective, the dollar loses half of its purchasing power every generation, or 35 years. (4) The Federal Reserve policy of long-term inflation has made American manufacturing uncompetitive, raising the cost of United States manufactured goods by more than 40% since 2000, compared to less than 20% in Germany and France. (5) Between 2000 and 2010, United States manufacturing employment shrunk by one third after holding steady for 30 years at nearly 20,000,000 jobs. (6) The American economy needs a stable dollar, fixed exchange rates, and money supply controlled by the market not the government. (7) The gold standard puts control of the money supply with the market instead of the Federal Reserve. (8) The gold standard means legal tender defined by and convertible into a certain quantity of gold. (9) Under the gold standard through 1913 the United States economy grew at an annual average of 4%, one third larger than the growth rate since then and twice the level since 2000. (10) The international gold exchange standard from 1914 to 1971 did not provide for a United States dollar convertible into gold, and therefore helped cause the Great Depression and stagflation. (11) The Federal Reserve’s trickle down policy of expanding the money supply with no demand for it has enriched the owners of financial assets but endangered the jobs, wages and savings of blue collar workers. (12) Restoring American middle-class prosperity requires change in monetary policy authorized to Congress in Article I, Section 8, Clause 5 of the Constitution. SECTION 2. DEFINE THE DOLLAR IN TERMS OF GOLD. (2) Federal Reserve Banks shall make Federal Reserve notes exchangeable with gold at the statutory gold definition of the dollar. SECTION 3. DISCLOSURE OF HOLDING.